Tanitoluwa Adewum, an 8-year-old refugee from Nigeria who goes by Tani for short, has proven himself to be quite the fast learner. 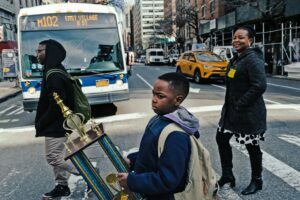 Tani was first introduced to chess just over a year ago when he started attending a public school in Manhattan. Now, Tani has won his age division at the New York State chess championship, going undefeated at the tournament. While is family is currently living in a homeless shelter, a GoFundMe for the family has far surpassed its initial $50,000 goal, which will hopefully changed that. What’s Tani’s endgame? Tani says, “I want to be the youngest grandmaster.” Read more. After couple Craig and Danica Shoji visited an underprivileged community in San Francisco in 2015, they wanted to dedicate their time to helping other people.The pair started a service called Laundry Love, that provided clean clothes to the homeless community. Shortly thereafter, they expanded their company to Revive + Refresh, and began offering a hot meal and a hot shower via a mobile unit to those in need. They have served more than 460 guests, with 250 people opting in to use the shower as well. Read more. Kyrie Irving has partnered with Underdogs United, an organization that raises money to help children get access to clean drinking water. Underdog United will be auctioning off a special Irving jersey, with the proceeds going to clean water initiatives in rural parts of the country. Irving’s good deed has inspired others, with the founder stating that after he joined the initiative, hundreds of other professional athletes joined, including Steph Curry. The organization also employs tailors and designers to create the jerseys. Vindah Kanana, the mind behind Irving’s jersey, said, “To create an original design for Kyrie, influenced by my Kenyan heritage, is an opportunity I could only dream of. It’s been amazing to see how this initiative is positively impacting our community and the health of our children.” Read more. 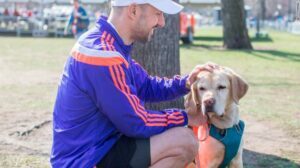 This past Sunday in New York, runner Thomas Panek made history as the first blind person to finish a half marathon with the help of guide dogs. Panek, the president and CEO of Guiding Eyes for the Blind, successfully completed the 13.1 mile run in just two hours and 20 minutes. An avid runner, Thomas Panek lost his eyesight in his early twenties but didn’t let it get in the way of his passion or his independence. His three dogs Westley, Waffle, and Gus have trained with him for months, and took turns helping him complete his dream of running the famous half-marathon without needing human guides. Read more. When Kansas State University student Cameron Koger was gifted a year of Qdoba after sinking a winning shot in a competition during a KSU game, he turned to Twitter to ask what to do with the generous freebie. As it turns out, he’s not a fan of Mexican food and wanted to gift the voucher to someone else. Inspired by some responses, he reached out to Manhattan Emergency Shelter in Kansas and decided to donate the prize to them, learning that his 52 free entrees would feed the entire shelter twice. In the spirit of generosity, Qdoba offered to double the amount of food donated! Read more.